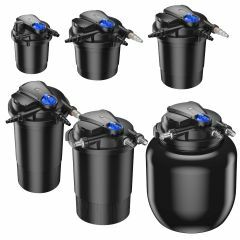 High quality automatic cleaning pressurised pond filters with UV sterilisers suitable for ponds up to 80,000 litres. These filters are available in a choice of 8 sizes to suit all sizes of ponds. Please see details below for detailed specifications for each model.